Pond-less waterfalls are simply a re-circulating waterfall/stream without the presence of a pond. 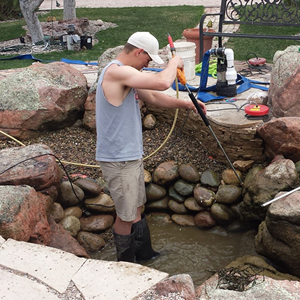 You get a chance to enjoy the sights and sounds of running water without the maintenance of a pond. Pond-less water features are becoming a more common choice among water feature enthusiasts because they are safer, they cost less, they fit into smaller space and they are easy to maintain. An ideal option for families with small children, you can add the sights and sounds of a natural waterfall without the safety concerns. Waterfalls also take up less space and can be tucked into any corner of a landscape and are an ideal option for adding curb appeal near the front door. 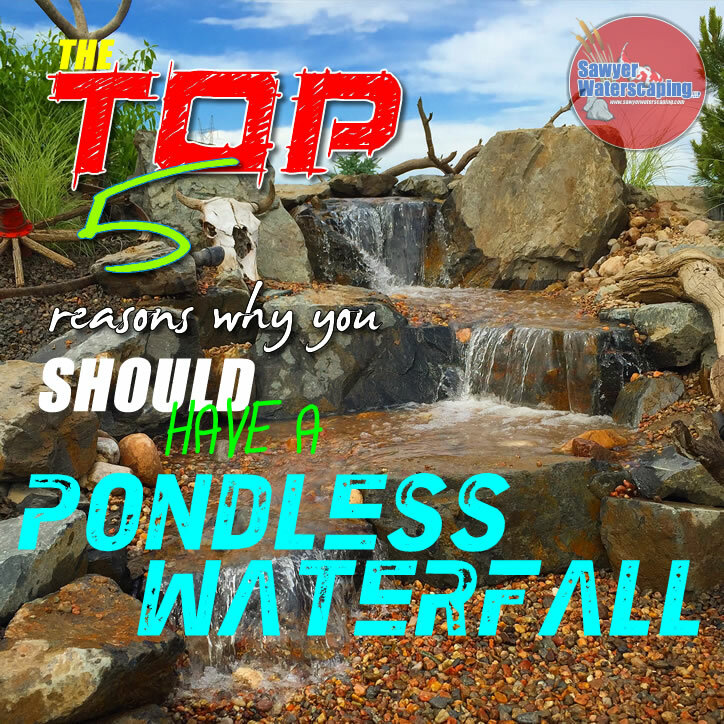 Before we get into the top 5 reasons why everyone needs a Pond-less Waterfall, let’s explain how it works. It might be difficult to imagine a waterfall and stream without a pond. Where does the water go? A pond-less waterfall works much like a regular pond. The reservoir is dug and then lined with underlayment and EPDM liner. 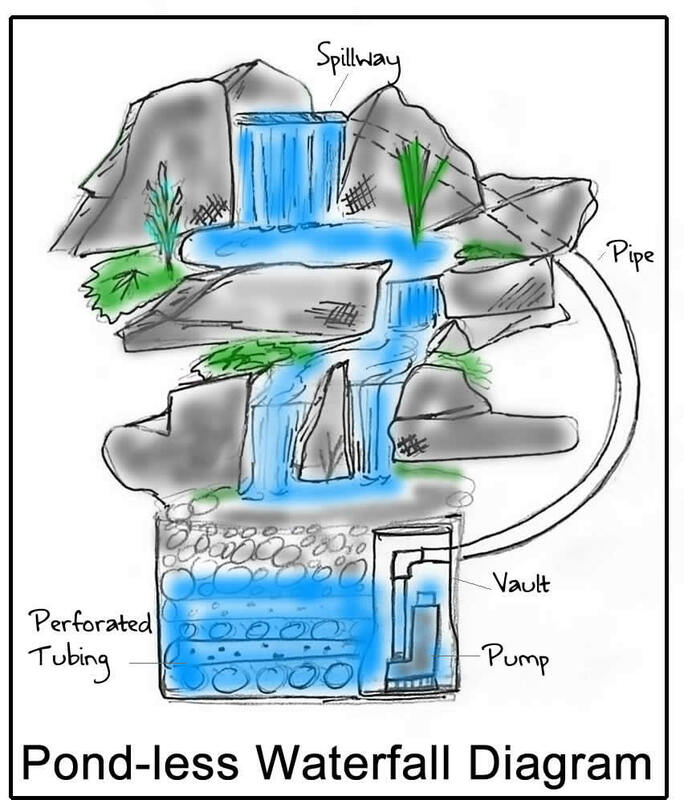 A vault (holds the pump) is placed at the bottom near an edge. It is surrounded by perforated piping and then covered in cobblestone, river rock and filled with water. The water is then circulated from beneath the rocks and gravel by a submersible pump that sits on the bottom of the vault. The pipe runs from the vault to the top of the waterfall where it flows into a spillway. The spillway collects and distributes the water into an overflowing waterfall. The waterfall flows back down to the reservoir. Since the water level never pools above the level of rocks, it looks as if the water has disappeared. Safety concerns are limited because there is no pool of water. This is what makes pond-less waterfalls such an appealing option for families with little ones. As a father of three, having the kids play in our pond-less waterfall is a lot less worrisome compared to them playing near our pond. 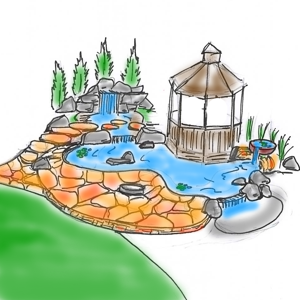 A pond-less waterfall is a great option if you are concerned about safety issues associated with a traditional pond. Putting a pond in your front yard can also be a bit worrisome when it comes to neighborhood kids and so forth. A pond-less removes that worry. Pond-less waterfalls can make that small weed patch in the corner of your yard come to life or they can flow and twist around your entire backyard. 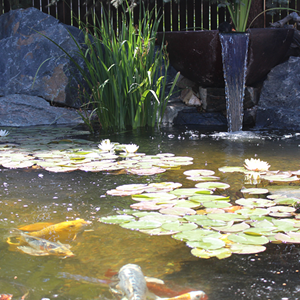 Space is not an object when it comes to imagining a pond-less water feature in your backyard. Unlike the traditional pond, typically much more space is needed. Pond-less waterfalls can fit into very small spaces. Cost can be a big factor when considering the type of water feature you want. In most cases, the price of a pond-less waterfall will be less than a pond because there is less labor involved, as well as less rock and materials. Operating costs are less too, because you are not dealing with a balanced ecosystem. You do not need to use as many pond products or run the pond 24 hours/7 days a week. Do you know the best part of a pond-less waterfall? Yep, you guessed it… the maintenance is super easy. Since there is no aquatic life, it’s okay to be more aggressive in treating it with the proper algaecides when necessary. Since the water in the reservoir is hidden from the sun, there is also less evaporation. Pond-less waterfalls are typically installed with an automatic fill. Since the reservoir is hidden from view, it is hard to know when to add water. An auto-fill acts much like a toilet float; when the water level is low, it adds the necessary water. The water source can come from your spigot or your existing irrigation system. Once an auto-fill is installed, you can simply sit back and enjoy. There is just something special about the sounds of a babbling brook. Moving water is just so tranquil and relaxing. The pond-less waterfall has made many water enthusiasts who were previously unable to enjoy the sights and sounds of a flowing waterfall, very happy. It’s a great alternative for those who are trying to get their feet wet, or looking to fit a little bit of paradise into their own backyard. When all else fails…go pond-less!